What Are These Mysterious Blue Boxes? You are here: Home / Western New York State of Mind / What Are These Mysterious Blue Boxes? I saw the first one a few weeks ago on the way back from Chili. Hidden in a tree along the telephone wires on Lehigh Station Road hung what appeared to be a blue jacket. Since I was the only one in the car, I didn’t get much of a look. I figured it was something left over from the many recent graduations. You know, like those crazy sneakers-hanging-from-the-telephone-wire things you used to see everywhere. Then, on the same drive home, I noticed another blue jacket hanging from tree shrouded telephone wires on Mendon Center Road. Again, I couldn’t take a good look. I arrived home and promptly forgot about these navy garments. What are they? My mind reels with the possibilities. Could they be the onset of some alien invasion? They appear to have cryptic markings on at least one side, but my zoom lens failed to discern the language. Or perhaps, in placing them deep within leafy branches overhanging telephone wires, maybe they are camouflaged surveillance devices furtively planted by this now-apprehended Russian spy network. If you have an idea what crazy story might explain the existence of these mysterious blue boxes, add your thoughts in the comment section below. Alternatively, if you know what they really are, let us in on the secret. Chris, are the markers for orienteering? Mike, that one’s a little too logical. I preferred to think they’re artifacts from a previously undiscovered northern excursion of the Mayan Empire. 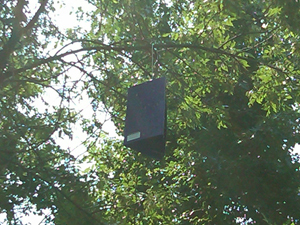 they are bat boxes, homes for bats to occupy. they help the bat population survive and flourish. some may not like bats but they actually are really helpful creatures for keeping our insect population in check. living in the southtowns I see them a lot. Thanks for playing along folks. We’ll see you next time. If you look closely they appear to be traps for insects. Since I’ve seen some on trailways also, I assume they are for analysis purposes by some government agency (like tracking west nile or lyme disease) and not for insect reduction….. I asked my father the same thing and he said they’re traps to stop that pesky wood-borrer beetle.